The evaporative emission (EVAP) control system limits fuel vapors from escaping intothe atmosphere. Fuel tank vapors are allowed to move from the fuel tank, due to pressurein the tank, through the EVAP vapor tube, into the EVAP canister. Carbon in the canisterabsorbs and stores the fuel vapors. Excess pressure is vented through the vent hoseand EVAP vent solenoid valve to the atmosphere. The EVAP canister stores the fuelvapors untilthe engine is able to use them. At an appropriate time, the engine control module(ECM) will command the EVAP purge solenoid valve ON, allowing engine vacuum to beapplied to the EVAP canister. With the normally open EVAP vent solenoid valve OFF,fresh air is drawn through the vent solenoid valve and the vent hose to the EVAP canister.Fresh air is drawn through the canister, pulling fuel vapors from the carbon. Theair/fuel vapor mixture continuesthrough the EVAP purge tube and EVAP purge solenoid valve into the intake manifoldto be consumed during normal combustion. The ECM uses several tests to determine ifthe EVAP system is leaking or restricted. If the EVAP purge solenoid valve does not seal properly fuel vapors could enter theengine at an undesired time, causing driveability concerns. The ECM tests for thisby commanding the EVAP purge solenoid valve OFF and the vent solenoid valve ON whichseals the system. With the engine running, the ECM then monitors the fuel tank pressure(FTP) sensor for an increase in vacuum. The ECM will log a fault if a vacuum developsin the tankunder these test conditions. This diagnostic creates a vacuum condition in the EVAP system. When the enabling criteriahas been met, the ECM commands the normally open EVAP vent solenoid valve closed andthe EVAP purge solenoid valve open, creating a vacuum in the EVAP system. The ECMthen monitors the FTP sensor voltage to verify that the system is able to reach apredetermined level of vacuum within a set amount of time. Failure to achieve theexpected level ofvacuum indicates the presence of a large leak in the EVAP system or a restrictionin the purge path. The ECM will log a fault if it detects a weaker than expected vacuumlevel under these test conditions. If the EVAP vent system is restricted, fuel vapors will not be properly purged fromthe EVAP canister. The ECM tests this by commanding the EVAP purge solenoid valveON while commanding the EVAP vent solenoid valve OFF, and then monitoring the FTPsensor for an increase in vacuum. If the vacuum increases more than the expected amount,in a set amount of time, a fault will be logged by the ECM. The engine off natural vacuum diagnostic is the small-leak detection diagnostic forthe EVAP system. The engine off natural vacuum diagnostic monitors the EVAP systempressure with the ignition OFF. Because of this, it may be normal for the ECM to remainactive for up to 40-min after the ignition is turned OFF. This is important to rememberwhen performing a parasitic draw test on vehicles equipped with engine off naturalvacuum. When the vehicle is driven, the temperature rises in the tank due to heat transferfrom the exhaust system. After the vehicle is parked, the temperature in the tankcontinues to rise for a period of time, then starts to drop. The engine off naturalvacuum diagnostic relies on this temperature change, and the corresponding pressurechange in a sealed system, to determine if an EVAP system leak is present. The engine off natural vacuum diagnostic is designed to detect leaks as small as 0.51-mm(0.020-in). The EVAP purge solenoid valve controls the flow of vapors from the EVAP system tothe intake manifold. The purge solenoid valve opens when commanded ON by the ECM.This normally closed valve is pulse width modulated (PWM) by the ECM to preciselycontrol the flow of fuel vapor to the engine. The valve will also be opened duringsome portions of the EVAP testing when the engine is running, allowing engine vacuumto enter the EVAP system. Turbocharged vehicles have a check valve in the purge tube between the EVAP purgesolenoid valve and the EVAP canister to prevent pressurization of the EVAP systemunder boost conditions. Note that the presence of this one-way check valve preventspressure testing the EVAP system for leaks at the EVAP canister purge tube connector. The canister is filled with carbon pellets used to absorb and store fuel vapors. Fuelvapor is stored in the canister until the ECM determines that the vapor can be consumedin the normal combustion process. A vapor path between the fuel fill pipe and the vapor tube to the carbon canisteris necessary for Vehicle Onboard Diagnostics to fully diagnose the EVAP system. Italso accommodates service diagnostic procedures by allowing the entire EVAP systemto be diagnosed from either end of the system. The FTP sensor measures the difference between the pressure or vacuum in the fueltank and outside air pressure. The ECM provides a 5-V reference and a ground to theFTP sensor. 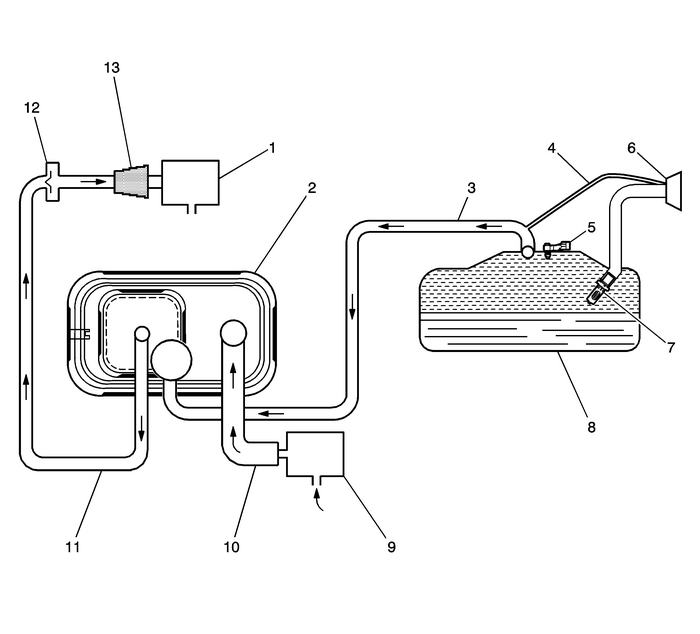 Depending on the vehicle, the sensor can be located in the vapor spaceon top of the fuel tank, in the vapor tube between the canister and the tank, or onthe EVAP canister. The FTP sensor provides a signal voltage back to the ECM that canvary between0.1–4.9-V. A high FTP sensor voltage indicates a low fuel tank pressure or vacuum.A low FTP sensor voltage indicates a high fuel tank pressure. The EVAP vent solenoid valve controls fresh airflow into the EVAP canister. The valveis normally open. The canister vent solenoid valve is closed only during EVAP systemtests performed by the ECM. Some vehicles may have a capless fuel fill design behind a locking fuel door. Thereis no fuel fill cap to remove. One just fully inserts the fuel nozzle into the fillneck, making sure it latches before refueling. Flapper valves close to seal this interfaceonce the fill nozzle is removed.